As the doggie makes an exit and piggie makes an entrance, different parts of Singapore are gearing up to usher in the new year, each in their own style. It’s pretty predictable that crowds will be bustling as usual at Chinatown with its festive street bazaars, or be dazzled by the pyrotechnics display and fireworks at River Hongbao. 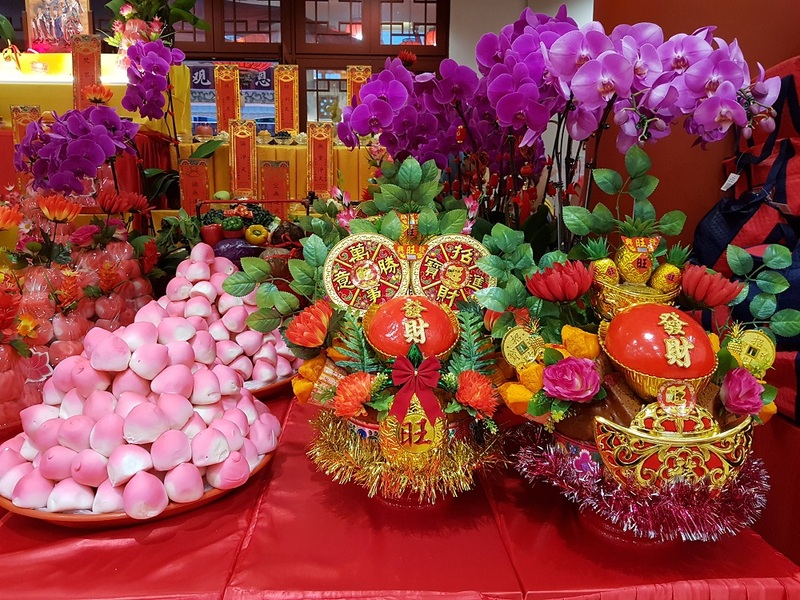 Why not usher in the year in another style – The Buddhist Style – that adds more insight to the Chinese New Year activities that we usually do to welcome a new year? Here are some tips to The Buddhist Style that BW Monastery is gearing up with before embarking on an auspicious year, with great blessings awaiting us. Contrary to what is traditionally believed, Buddhism is no longer an old stick-in-the-mud that our grandmothers follow but the younger generation is following the teachings of the Buddha too. With Chinese New Year being celebrated by the young and young-at-heart, BW Monastery opens its doors to a party comprising of all generations coming together. It’s going to be a lively countdown session to get ready for a super-lucky-ultra-prosperous year, and what could be livelier than the monastery’s very own auspicious dragon dance to rouse the festive mood? You’ll find the uncles and the aunties letting down their hairs and having fun with the young ones, even the grandmothers join in the fun. While the countdown party symbolizes the welcoming of a super-lucky-ultra-prosperous year of happiness, before getting the party started and having fun, we need to start off the new year on the right foot by getting our intentions right. Venerables will be present before the countdown party to lead all devotees in prayers. So this is the time when we reflect on the afflictions and attachments that have troubled us over the years and as the venerable lead us in the prayers, we supplicate with sincerity to be able to awaken our hears and mind towards letting our troubles go with the practice of compassion and wisdom. One of the main highlight of the night is BW Monastery’s abbot, Venerable Jing Yuan, leading everyone in the chanting of “The Bell Verse” which is a very beautiful tune used by traditional monasteries since thousands of years ago. The words to the moving tune speak of the deepest wish for the country to be harmonious and peaceful, its people to be well and happy, as well as all sentient beings to be enlightened. With the sacred and solemn striking of the bell, this symbolizes the ushering of the New Year with all Buddhas and Bodhisattvas and welcoming the God of Fortune. Conventional practice on the first two days of the new year would be dressing up in new clothes and off you go house-visiting relatives and friends. No, no, no…… that’s not the Buddhist Style of this era today. What’s the start of an auspicious year if you don’t start off with something auspicious?? And what else can be more auspicious than receiving greetings from one of the Three Jewels – the sangha community? There will be a few sessions of CNY Greetings by the venerables at BW Monastery, and not only that, there will be intricately planned activities themed with auspiciousness and blissfulness, like The Blissful Highway of Prayer Wheels, sprinkling of flower petals over the Buddha statue and there’s even a statue of the Maitreya Bodhisattva that nods and smiles. You’ve got to admit, photo-taking is one of the must-do’s during the Chinese New Year. We take photos at the reunion dinners, we take photos at whatever big red flower decoration that we see at the malls, we even take photos wherever we sit. This together-ness is very precious and will certainly leave memories for everyone. Then why not take a photo with BW Monastery’s iconic “The Bliss Glow Family Lantern”? Otherwise known as the Family Lantern of Abundance and Blessings, it symbolizes a bright future for our next and future generations, bliss and harmony within the family and freedom from obstacles at work. This gigantic lantern is the biggest ever in the northern part of Singapore. Now this is what we call glowing with family harmony. And just when you think that the festivities die down after the first two days of the new year? Apparently not at BW Monastery, since the Lunar New Year runs for a period of 15 days . In between Black Jack, 3 Kings, Bacarat and Mahjong, these are friendly games that families and friends bond together and a winning streak is believed to symbolize a year of fortune. There is also another belief that Chinese zodiac sign conflict with Tai Sui each year, and one who belongs to the zodiac sign that is in conflict will encounter misfortune and bad luck. This belief belongs to Chinese astrology, Feng Shui and Taoism, but to a much lesser extent in Buddhism. Contrary to what should be believed, it is definite that we do not wish for misfortune and we welcome more fortune instead. So the best way to improve one’s fortune is to accumulate merits and purify obstacles, and of course BW Monastery has definitely made plans for this. There are several sessions of Fortune Blessing Prayers that are lead by the venerables, and they are spread over a few days at different timings. Here’s where devotees can make mass offerings to the Three Jewels, supplicating for abundant merits and wisdom, good health as well as the clearance of obstacles. On the last day of the Lunar New Year, the lively atmosphere of the Chinese New Year celebration would have significantly died down. Similar to taking our leave at a party by giving our thanks and appreciation to the host and everyone else for having a good time, this is a time where we pay our gratitude to the Buddhas and Bodhisattvas for the good things that have taken place in the past year, and give our thanks for the strength to be able to make things work out when times are bad. At the same time, we can make wishes for a better year for not only ourselves, but for everyone and even the country. The Offering to Buddha and The Heavenly Realm Puja is a very dignified prayer session with chanting, where devotees can make offerings to the heavens, pay respect and gratitude to the Buddhas and Bodhisattvas as well as supplicate for the country to have prosperity, peace, and social stability for its citizens. Well, there we are, 7 great tips altogether to ensure an auspicious and meritorious start to a great year, why not try it The Buddhist Style? Sign Up For Our CNY Eve Party!